Use your mouse to aim and shoot! 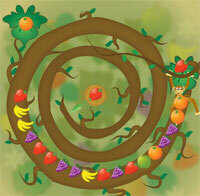 Try to eliminate as much fruits as you can, before they fall down. Score points by grouping 3 or more fruits of the same type. At the end of the game you will be able to submit your score!